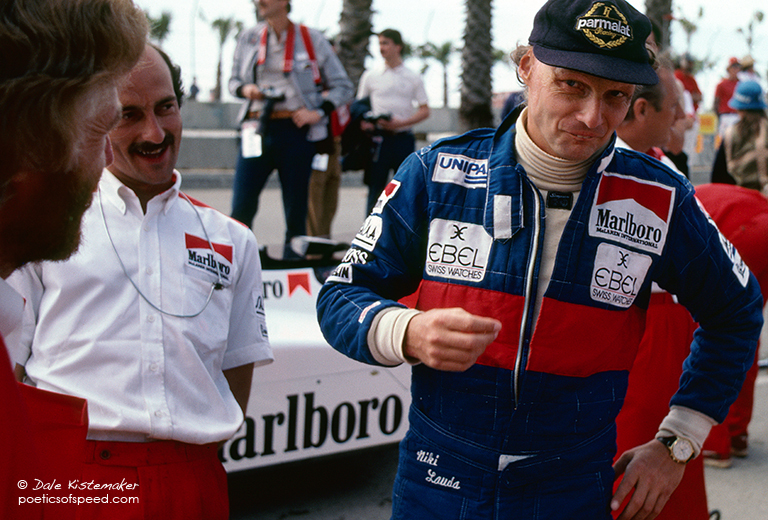 Niki Lauda was an intense, analytical and fierce competitor. But he was also a multilayered, complex person who spoke his mind clearly. Among crew and friends he also could reveal a sharp sense of humor. Poetics of Speed has been receiving some significant traffic lately. Ron Howard’s movie Rush has generated interest in Niki Lauda and my portraits “Niki Lauda – Detroit Grand Prix 1984” and “Niki Lauda With Balaclava – Monaco GP 1984” have made the front page of the Google image search for Lauda and brought thousands of visitors here. Wow! Thanks! Congratulations on the increased traffic. My wife and I saw Rush last weekend, brilliant movie. Then we watched an excellent documentary called “1” on iTunes which is a about the golden years of F1, but also the most dangerous. Right you are… Lauda was portrayed without the sense of humor in the film, and that’s probably not quite fair. it’s a common mistake when talking about true geniuses. They can come off like total assholes to those who don’t understand them, but are really just confident beyond our desires.